For a person buying a semi and trailer it’s important to know what you need and invest accordingly. “We try to represent our trucks with the best history we can. The main thing we tell people is to not overbuy or under-buy; just get what you need. There are some good, solid trucks that are cheaper than what a person might be trying to do with a pickup. Some inexperienced guys seem to overbuy and get themselves in trouble. Then we get the truck back and resell it. It’s important to match the truck to their needs,” Miller said. Carpenter suggested looking around before buying a truck. “Nearly every town has somebody that does custom hauling and you can see what they are using, and talk to them, and see if they would help you get some experience for whatever application you are wanting to use the truck for,” he said. Many farmers and ranchers today are buying their own semi-trucks and trailers, to haul hay, grain and livestock. Before making the big purchase, they will want to consider some key points. Bruce Carpenter, a trucker based in Gooding, Idaho, has driven many kinds of trucks, hauling all kinds of loads (in all lower 48 states) for the past 30 years, including several years hauling water, drill steel and other supplies for the oil industry in North Dakota. Regarding weight and capacity for a farm truck, he says it all depends on what state you are in, the weight limits, and criteria that qualify it as a farm truck (without the driver needing to have a commercial driver’s license or CDL). “All the states are different; find out what is required in your state. It depends on whether you are hauling to and from your farm within a short distance. If you haul across state lines you must have a log book, and weight limits are different,” Carpenter said. There are weight limits in each state for what constitutes a farm truck, according to Jerry Miller, sales manager at 18-Wheeler Truck and Trailer in Rapid City, S.D. “We recommend buying an annual overweight permit and most farmers do. That’s a one-time fee of $60, so if they happen to have a load sometime that’s over the weight limit they would be OK,” Miller said. If hauling within the state, a CDL isn’t needed. “They can haul within a 150-mile radius but need to be familiar with the regulations of the state they live in. Many farmers and ranchers have found that they can use their own trucks as a tool to save money and make money; if you hire it done it costs $4 to $6 a mile to haul hay. 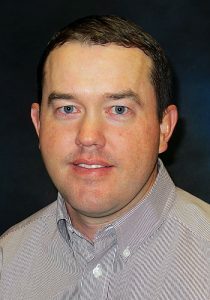 It doesn’t take very many loads to make it cheaper to own your own truck and trailer,” Miller said. “In many states, if you are hauling something for your own farm, your truck can be licensed for farm use,” Carpenter said. “In Idaho, for instance, I am hauling milk and we don’t need a log book because we are not going over the distance limit. If a person starts doing commercial hauling, they must have a CDL, medical certificate, etc.” For a truck that is only hauling your own hay, grain, livestock, etc. there are farm exemptions. Different trucks vary in mileage they get, depending on the speed, load and gear for doing the job. “Mileage you get will also depend on whether you are pulling one long trailer, two trailers or three trailers. Today you’d probably be looking at something with at least 500 horsepower, and then you can haul just about anything (hay, grain, cattle, farm machinery, etc. ),” Carpenter said. Many people choose used trucks, to save money. “This is often your best bet — finding a good used truck rather than spending $130,000 for a new one. When you buy a new truck you also have to pay excise tax to the federal government, which is around $20,000. You don’t have to pay that on a used truck,” Carpenter said. “There are many used trucks available with automatic transmissions but these are not as good for farm hauling. I saw a couple guys in North Dakota hauling water and in the wintertime those trucks were a nightmare. They couldn’t go anywhere on the icy roads; they couldn’t get up the hills,” he said. On a farm or ranch you may be hauling on bad roads and rugged terrain and you want a truck that can handle those conditions, and an automatic transmission won’t handle it, he said. His favorite all-purpose truck is a Kenworth T800. “Those are the best; when we were hauling water in North Dakota in bad conditions, those trucks held up better than anything. Some of the other trucks work well, too, like Peterbilts. The Kenworth T800 holds its value better than any other truck, as far as used trucks go,” Carpenter said. 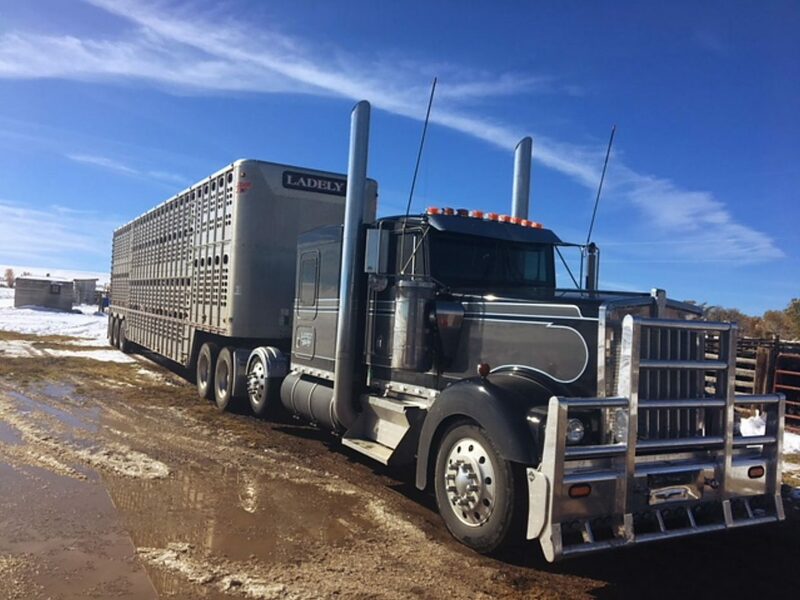 Miller said most ranchers in his area are buying either Day Cab Trucks (with an engine forward of the cab, with a conventional hood configuration — without a sleeper berth) or cheaper tandem-axle trucks. “Some of the larger farmers want pusher-axle trucks so they can haul as much weight as possible,” he said. The big trucks vary in what kind of mileage they get because most farm trucks are pulling heavy loads. “It varies between 4.5 and 6 miles per gallon, depending on the load, and whether they have very many hills to climb,” he said. “A lot of farmers and ranchers only put 10,000 to 20,000 miles on a truck each year. These may be rugged miles, but it’s not a lot of miles.” The farm equipment isn’t going thousands of miles and will hold up a long time if you take care of it. “A semi will take more maintenance than a pickup; you don’t want to neglect anything,” Carpenter said. “It has to be running properly, because periodically you will be checked on the highway, no matter what kind of plates (farm tags) you have, and if things aren’t up to par and there are any safety issues, you will get a ticket and that truck will get parked. It can’t move again until it is repaired,” he said. Miller said maintenance is very important for any of the big trucks. “They will usually go 10,000 to 12,000 miles between oil changes, and it’s important to keep up on maintenance whether they are new or used. In winter most people use blended fuel so they will start in cold weather and won’t freeze up. They need to be plugged in or put in the shop,” he said. There are many options in trailers, and your choice may depend on what you haul — whether cattle, grain, hay, etc. — and the state’s weight limits. “Always check on those limits first. You can talk to your state government; find a DOT officer who will talk to you and answer your questions,” Carpenter said. “Most ranchers in our area are buying ground-load trailers because these are very efficient and can be used in pasture situations,” Miller said. “These trailers can haul 28 to 30 cows, and with the ground load cattle can be loaded or unloaded anywhere. A lot of ranchers have permanent corrals in various places, or portable corrals. With the ground load they can load from any corral and unload in a pasture with no corral,” he said. “For hauling grain they’d need a tandem or a triple-axle grain hopper. These usually have the same weight capacity; you can usually put 45,000 to 50,000 pounds of grain on these, and a hay trailer would be similar weight,” Miller said. There are several options in hay trailers.